I’m very excited to present my 2016 Christmas Amigurumi Series! Yay! Happy Dance! They are finally available. I also have an exclusive Etsy discount I wanted to share today but first let me introduce these cute Christmas Ami’s. Noel the Reindeer, Happy the Snowman and Baker the Gingerbread Man. I spent several weeks sketching and crocheting this Christmas series and I’m so very proud of them. As always, I got creative assistance from my kids and of course their approval on the final design. 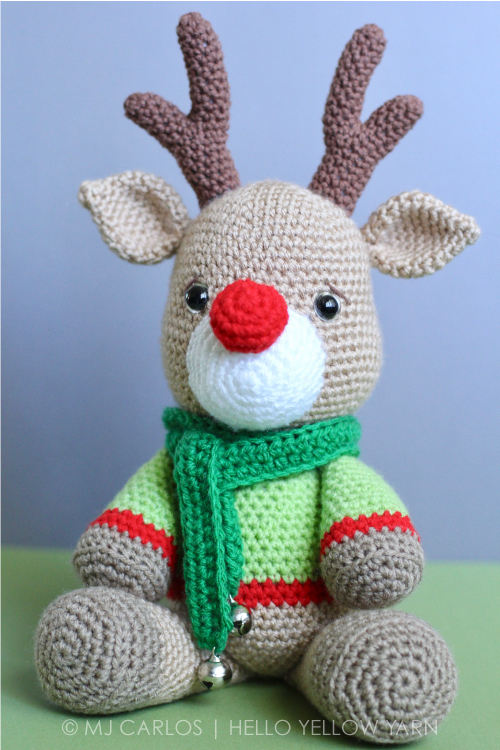 The first of the series is Noel the Reindeer. My husband suggested the name which I really like. It’s very fitting as Noel translates to “Christmas”. I sketched two designs of this reindeer – one with a sweater and the other without. I got my kids to pick which they liked best and of course the one with the sweater got their vote. My original design didn’t have any bells but I thought it would be incomplete not to include jingle bells to a Christmas reindeer, so I decided to add the bells to the ends of the scarf. 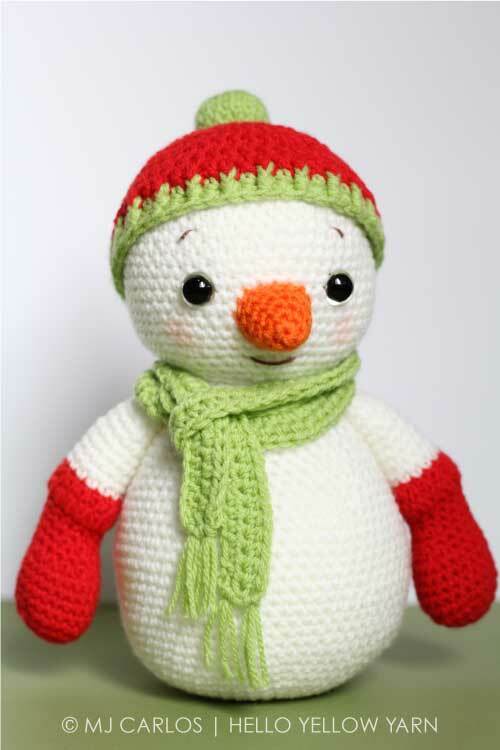 Here is Happy the Snowman. By far the quickest and easiest to make out of the three as he has no legs so there’s not a lot of sewing to do. My favourite part is his hat. He just looks so cute with it but he still looks good even without it! 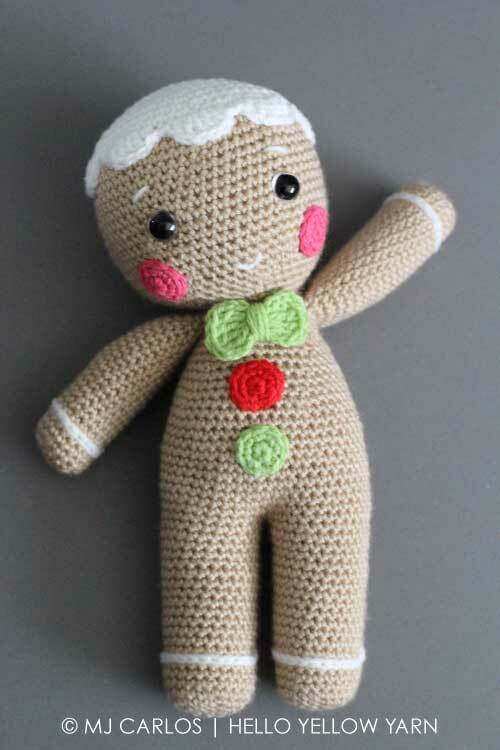 Finally, Baker the Gingerbread Man. He is my son’s favourite of the three. He just looks so sweet and innocent. As with the reindeer, I made two sketches of the gingerbread man. The first had three red buttons and the second which we ended up choosing, had 2 different coloured buttons and a bow tie. I had to start over this amigurumi as the first time I made him, I didn’t realise I had used two different shades of beige. I was working on him late at night and didn’t realise until the next morning when I picked him up and saw that his head was a different colour to his body. Oops! My mistake for not working with proper lighting. But alas, it was a good thing I started over. The torso was too short and the head too small. Good thing we crocheters and amigurumists are patient people! All three patterns are now available from my Etsy and Craftsy stores. They are available individually or as a set bundle. Now onto that Etsy exclusive discount. Christmas is fast approaching so from now until 31st December 2016, use code: XMAS2016 in my Etsy store and save 15% off your order. 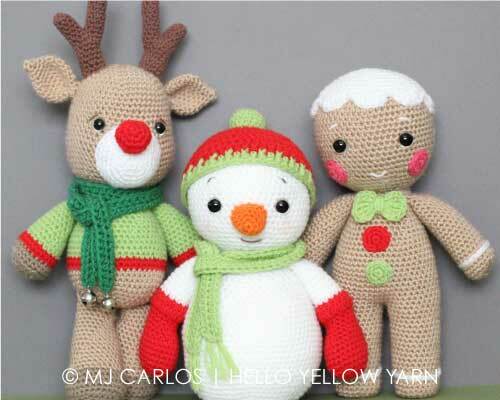 I hope you enjoy crocheting these Christmas cuties and if you do, I would love to see a picture, it always makes me happy – post a picture on instagram and tag me @maryjcarlos (or #helloyellowyarn) or post on my Facebook page.